The National Insurance Task Force (NITF) has conducted three, two-day classes of its Certified Insurance Counselor Training Program at Neighborhood Reinvestment Corporation Training Institutes. These were held August 30-31, 1999; October 16-17, 2000; and October 15-16, 2001. There were 25 participants in each class, yielding a total of 75 certified insurance counselors. These counselors returned to their local nonprofit organizations equipped with a training manual, a PowerPoint presentation, and a new understanding of the insurance industry and of clients' insurance needs. 37 residents who participated in the NITF Home Safety programs. These survey were given during focus-group sessions in St. Louis (Missouri), Staten Island (New York) and Richmond (Virginia). Copies of these survey forms are contained in this report. 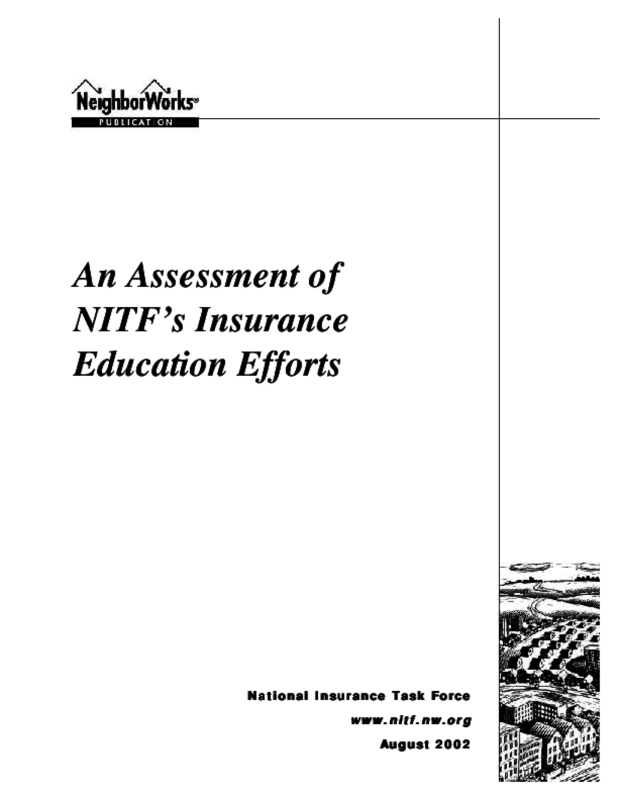 Any other insights that might prove valuable to NITF in considering the overall effectiveness of its insurance education programs.